Round-trip transportation to/from LAX to the Disneyland Resort and Anaheim Resort Hotels. Fast, easy and reliable transportation to the Anaheim/Disneyland Resort area. *Children ages 2 years and under are free, but must sit on the lap of a paying adult. After exiting the baggage claim area, lower level, proceed to the outer traffic island. Buses pick up beneath the overhead GREEN signs indicating Flyaway, Buses, Long Distance Vans. Please look for a full size coach - Disney® character wrapped bus or a plain white bus with a sign in the window that reads the Disneyland® Resort Express. Bus starts at Terminal 1 and will stop at each consecutive Terminal. Please allow up to 5 minutes between Terminals. A ticket agent will board the bus at LAX and collect your voucher. 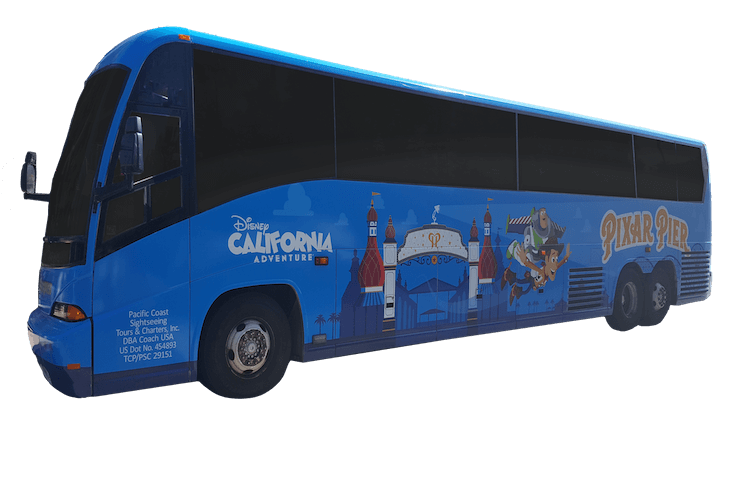 If a ticket agent is not available at LAX, then upon arrival at the Disneyland Hotel an agent will board the bus to collect vouchers. Buses depart hourly beginning at 7:00 A.M.-8:00 P.M. Last bus departs at 8:00 P.M. Call 1-800-828-6699 at least 24 hours in advance for return reservations. Hourly departures starting as early as 5:20am. (please see Disneyland Resort Express Pick-up Schedule). Last bus departing out of Anaheim at 8:00 P.M. Hourly departures from LAX starting at 7:00 A.M., with departures approximately every hour, last bus departs LAX at 8:00 P.M. Last bus departs out of Anaheim at 8:00 P.M.
E-Ticket expires 1 year from purchase date. Transfer E-Ticket expires after redemption for Round Trip. While most E-Tickets are sent within minutes, please allow up to 2 hours for successful email delivery. If you wish to modify your reservation date(s), Hotel name/address, please contact the provider, (800) 828-6699 or (714) 978-8855 or e-mail anaheim.reservations@coachusa.com, a minimum 72 hours prior to departure. Other modifications to your current order? Please contact Undercover Tourist with your order number and details of the modification requested. Tour services provided by PCSTC, Inc. dba Southern California GrayLine. Booked and Payable by InsiderGuide.com, LLC dba Undercover Tourist.